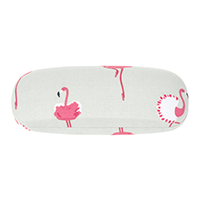 Sophie Allport Flamingos Glasses Hard Case keeps your glasses safe and prevents them from being squashed. The outer case is made from matt oilcloth whilst the lining is soft velour. It's a stylish and practical accessory for your reading glasses, sunglasses or bifocals and makes a great gift for any friends or family that wear glasses. Includes a Sophie Allport cleaning cloth for your glasses. All products are made from rolls of fabric with a pattern repeat design. This means placement of the design featured on each item will vary.